SPYSHOTS: Proton testing Suzuki Vitara – new SUV? Home » Cars » SPYSHOTS: Proton testing Suzuki Vitara – new SUV? Well, look what we have here – reader Max Pang has sent us images of a Suzuki Vitara being parked near Sports Arena Cyberjaya. This is a significant sighting because Suzuki has already stopped sales of its vehicles here as part of its joint venture with Proton, and the mule – which has had its badges taped up – sports Selangor trade plates that typically adorn Proton’s prototypes. If you’re wondering why the national carmaker is still working with Suzuki on a new model even as it is on the verge of being acquired by Geely, well, your guess is as good as ours. For what it’s worth, however, chairman Datuk Seri Syed Faisal Albar has previously said that it will honour all existing partnerships (with Honda for the Accord-based Perdana and Suzuki for the Ertiga-based, er, Ertiga) until they run out. There is some logic behind readying a Proton-badged Vitara – while the company is working on a new SUV based on the Geely Boyue, that car is still a year away at least. Before then, Proton will have no new product beyond incremental updates to existing models, like the one already applied to the Iriz this year. What’s more, a smaller crossover like the Vitara would allow Proton to tap into the cheaper, more lucrative B-segment SUV market occupied by the likes of the Honda HR-V, Mazda CX-3 and upcoming Toyota C-HR – and, crucially, do so before Perodua enters the scene, as the latter has already hinted at doing. Aside from the aforementioned covered-up emblems, the Vitara shown here is identical to the one sold elsewhere, following the template set by the Proton Ertiga. With limited changes from the original, Proton would be able to quickly roll out its own version to give its current lineup a much needed leg-up. Of course, this is all just pure speculation, and we’ll need to wait for official details to know for sure. It should be noted that this Vitara is the global model, rather than the smaller, more barebones Vitara Brezza sold in India. If a Proton Vitara does end up coming to fruition, expect it to come with the proven 118 hp/156 Nm M16A 1.6 litre naturally-aspirated petrol engine, mated to a six-speed automatic transmission. What do you think of a Proton Vitara SUV? Sound off in the comments after the jump. It’s a great car. I drove this back in uk. It has great fuel efficiency and handling. Just close down this unfocused company. Already sucked RM20 billion from tax payers money and still have not paid back. Don’t forget, it is this company that made other Japanese cars go up by 700% the past 30 years when the same Japanese cars in Japan only gone up 40% in the same 30 years. Hutang ady paid. Apa lagi lu mau? Be contructive. Don’t just bash without brain. I better buy Perodua. At least when I go kenduri, if I am driving Proton, I have to park far away cause malu. By doing so, Proton does not have to waste resources and money on loss making models. They can also downsize their overbloated staff by half. Proton does not seem to have any focus. Just main bantai only. Look at Ertiga, sales are near ZERO and yet, it is a full Suzuki. Surprising why a full Suzuki with 100% Japan technology has not appealed to Malaysians. Unfortunately, Proton has to pay few hundred million ringgit in Royalty for Ertiga despite sales being bad. This SUV will be another case. Proton will have to pay royalty to Suzuki. Then nobody buys it, money again wasted. Will not launch very soon. Maybe 2019. Boyue in 2020. Brace for lots of teasers in Paultan for the next 20 months. Ini comment memang win. The first comment trying to create good perception about the car kena shoot down just like that. If Suzuki themselves cannot sell their own car here, why does Proton think their rebadged Vitara can laku? Proton should rebadge something that originally sells well. Honda is selling well because of the brand and models. Nothing to do with DRB. The HRV didn’t affect the CRV. People just choose what size they want. Vitara is B segment SUV, Boyue is C segment SUV. Vitara is a 2.0. It’s a not a B seg SUV. Bye bye volvo xc40 before it launch here in Malaysia. If proton can get 1.4 boosterjet turbo engine from suzuki would be cool. And is it possible in future proton can rebadge suzuko swift? Hehe. Good handling???????????? In this Japanese cars????????? Looks like Proton tak tentu arah now. Which is it? Proton Vitara or Proton Boyue? Don’t the bodohs at Proton know that China will get angry if there is a Japanese SUV by Proton? Everybody knows, China and Japan both of them got some problems with each other. They both compete with each other. to rebadge Proton vitara, Few more billions for R&D. There will be 2 SUV one called Proton Vitara and the other called Bao Teng Boyue..patriotic Malaysian will buy Proton Vitara of course..
Makan suap lah, somebody inside the original company. Purposely to mesh up everything. Purposely to make Geely angry, so as they will sell back at RM 1. Then they can start their begging stories again. When there is no Bogue, they don’t want this idea; they purposely want to create deficit to beg money, and the money is channelled to friends and themselves. The original company should just close shop. Tutup kedai and mampus. As long as sellable why worry so much. Been seeing you using different name to keep bashing proton, key board warrior must be pay very badly that you need to copy and paste so many posts again and again. Very shameful job. Proton Vitara or Proton Boyue is different market, and different price. no problem sell both. The Vitara and Boyue are 2 different segments. The Vitara is HRV segment, where as Boyue is CRV segment, so no direct competition. You understanding of China & Japan is behind time. Hisense just bought Toshiba electronics. So Japanese will be working for China bosses. In Proton a Japanese has been hired to report to a China CEO. u baca habis x artikel atas tu..
Geely isn’t even twitching about this. Who are you to call them ‘bodoh’? proton’s new manufacturing vice president is a japanese (yoshiya inamori), what’s the problem? geely is an international company anyway, as long as money is generated, why not? cant you read? this car is possibly part of the proton-suzuki deal tht proton has said will continue to honour after the geely acquisition. wouldnt mind if we get vitara first before boyue. it sure looks good. At least it’ll handle way better than it originally came. Always buy a car from a cash rich company. Cause when you claim warranty, they will never argue with you and say the part is not covered under warranty or find an excuse you were late in your servicings. Then pls explain how come a company with “money” dun wanna honour warranty claims for Alza flying axles? I hope someone can teach Proton the culture in China. When China extends a helping hand, they expect full commitment. They expect you to give your full self to China. Geely leaves, Proton only rugi. Cause nobody wants Proton. Geely once borrowed and licensed Toyota engines for their compact sedan back in 2005 until 2016. Not to mention Proton currently has Japanese and Chinese in their board of authority as well. You do know that Proton could commit to Geely and work with other carmakers at the same time right. That’s just how business works and putting nationalism will just hinder them eventually. Got, the government of USa will help Electron again by giving Rakyat’s money to them secara percuma. You see, Geely bought using hundreds of millions and then sell back at RM 1 like an angry bird, berbaloi lumayan, kan ? Suzuki regret pulling out, and now want bao teng to help sell their vitara? Go sell yourself la, bao teng busy improving their own kangkung dish la. Better than the not sellable volvo cars. Please quickly bring to market. It should be Suzuki regret working with Proton. Thinking that the partnership will work, they went to close up all their outlets. Anyway they deserve it. Proton Vitara? Yes for me if priced reasonable. maybe less than RM70000.. Imagine you can have a CRV-sized Boyue at RM 68k base-spec, and 88k full-spec 4WD, do you still want the milo tins? The best bet is probably a base spec Boyue with 6 airbags + ESP + autonomous braking to fight top-spec Myvi. After all it is only a difference of rm 12k right? You are ‘buta’ if you still choose a Myvi. Have you seen a real Boyue? I think proton vitara will cost much more. Maybe RM90k or higher. My guess. The Vitara isn’t made to be a budget SUV. Not unless this is based on the Maruti Brezza. Suzuki sold the Vitara for 120k, CBU. Under Proton and local parts, probably approaching 80k for a base version. Just do away with the cronism tax and give back the rakyat the real price of cars. if consumer also knowing this Vitara is one and done, who will buy it? another Tiara of SUV? There is no long term planning and keep launching different model name, consumer who bought it all suffered..why Saga and Persona still sell? they are the one left with the same name with upgrade.! Pls define what u mean by “real prices of cars”, since with AFTA, all ASEAN assembled cars r priced similarly or more exp in tomyam. Nice.. will cancel myvi booking for this..
RM59K++ In SARAWAK, I’ll take one!!!! Bao Teng Vitara at RM 54 K ??? What is the price in Langkawi? All these sentences are taught by Proton to their cyber clowns. no way it sell 54K, just dream. minimum will be 70K, to fight with HRV, subaru vx, new perodua SUV etc…..
RM54k you wait long long. haha if rm54k i will take out all of my hard-earned savings and buy this car cos its a deal of a lifetime! And you don’t prefer a CRV-sized Boyue at RM 68K? You can’t get a Boyue at RM 68k if a Vitara is in its way acting as a price hurdle. The price of RM 68k is achievable. Geely knows how to package it. now this is more interesting than the new XV…..
i’ll choose this over XV anytime. come on bao teng make it below 60K! It may be XV challenger if its a suzuki. But being a proton rip off, it is worst than anything you can imagine. Nice! If the price below rm60k then take my money! Great idea and if sold here should be priced below RM50k. This Vitara has been tested for quite some time by the RnD guys at PTMSB. But its purpose is just for benchmarking test with their soon to be launched Boyue. Somehow i think the management felt the imminent threat of Perodua B segment SUV, theres quite some probability that they will actually rebadge the Vitara. Keep fingers crossed. Proton chinese CEO already said in 2018, there will be NO new car coming up except BOYUE. 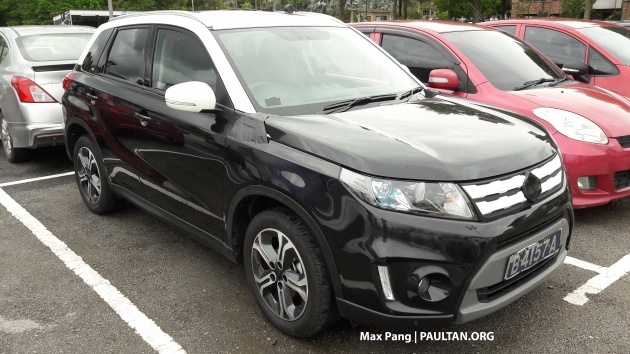 I know i heard somewhere that proton do currently have a vitara in their possession and it is supposed to be their first suv before geely acquisition but as geely bought proton, the vitara is now a test platform and probably a benchmark material for the boyue later. I’d like a b segment suv to tbh. CKD this model and sell it for 90k full spec with advanced safety like AEB and Adaptive cruise control and this thing will surely take a bite out of BRV and HRV sales. It could be a potential successful model. Because it 1.6, price could cheaper than HRV or CHR. Its 6-speed auto is a plus point. Last but not least it has proper temperature gauge unlike the HRV and other B segment cars like City and Vios which only have the low cost blue and red idiot lights. Looks not bad, has a lot of EU styling (ie Land Rover). But they need to ditch the cheap looking unpainted front bumper insert. Once glance thought it was the inline with recent proton news… Proton Savvy. Lol , quite a resemblance. If they offer this Vitara with 2.0 model and spec it up reasonably well together with affordable pricing. Proton might just have a winner here! Saw this Vitara in Japan. Very attractive and sporty indeed. Why 1.6 engine. Last vitara was 2 litres. Seeing that the novelty of boyou coming in is wearing off, this proton create another “excitement”. This is always their operating cycle. Their clowns will portray that if these models come in, it will sell like hot cake. And we all know how it end up. Hopefully Proton do right this time. Proton please Bring 1.4T version Vitara which become new engine replace 1.6 in worldwide, not bring in 1.6NA version. but 1.6NA still sell as low Spec Virata MT. 1.4T much lower fuel consumption also better power and acceleration than 1.6NA. From picture it show AT spec without 4WD control, indication is Vitara Turbo-S 2WD version with 6AT. hopefully just bring in also Turbo-S 4WD version. Hi Proton please dont forget Suzuki Alto! our market alto stuck at seventh gen 2009–2014!! proton is seriously desperate. the usual concerns are, suzuki is a quality car but with low sales figure, parts will be expensive and total cost of ownership will be a nightmare. Proton should also rebadge Toyota, Subaru, Mazda, Izusu, Dihatsu, Honda, Suzuki, Yamaha, etc…..That should put Malaysia in the book of record that lays claim that Proton as the most “rojak” car manufacturer in the world. Well, if Proton comes out with Vitara rebadge… it’s even better than that UMW Toyota delayed CH-R.
Proton should hv listened to the public for making an SUV instead of making tht pathetic Ertiga which sales are so bad. Since thre is no Kembara replacement around, there is good chance tht it can sell. Time is key here. Quickly get the SUV ready for sale before Perodua roll out Toyota Rush based SUV. Anyways kudos for using a conventional 6 speed auto rather than cvt. As Hafriz mentioned in myvi review , ” cheap cvt has slow throttle respond” . You are right. That’s why Greatwall M4/Haval H1 has been selling quietly like hot cakes in this 50-60K price segment. Sales have surpassed 20K units since launched. this model launched in 2015..! always backward..
1st inspira.. lancer 2007, inspira 2010..
then perdana.. accord 2008.. perdana 2016..
after that, Suzuki Ertiga.. launched 2012.. then proton Ertiga in 2016..
should plonk in the 1.6 CFE engine instead with some ECU remap to 150hp, the very least. Hope Proton dont make the same mistake to get the old engine like Ertiga and Honda Accord which is a failure. They must get the latest engine for malaysia Market to beat his competitor like HRV. Wow!! Meaning that this deal with the Proton badge vitara must have gone through before Geely came in the picture. So they will need to honour their agreement with suzuki and to make it Proton Vitara. Having said that, does this conclude that Proton will be selling Geely, Honda and suzuki cars that will be rebadged? I guess it’s just using Proton as a platform to reduce the prices of the cars. Such as the Ertiga. Syabas Proton, it’s a good move and that the small SUV market is a big hit now. So now we have another option compared with the HRV and BRV. Not to mentioned the 2018 toyota rush. Eh ProTONG! What the heck is this? Why the heck are you under-utilizing LOCAL ideas (from the likes of Azlan Othman etc) and lately your tie-up with Geely and now back to Vitara/Grand Vitara or what not…..WHAT and WHERE THE HECK IS YOUR FOCUS??? Time to REALIZE Malaysians’ own brain for automotive design these days! Why can’t the likes of Saharudin Busri as well as Azlan Othman be trusted these days?? It’s not a matter of trust. It’s a matter of scale and convenience. We can develop a full scale mini SUV if needed but the costs are exorbitant for the market that we have here in Malaysia. It costs millions to develop, test and ensure that all parts sourced are of the quality that we need to be liked by Malaysians. It is much more cost effective to rebadge a platform like this and get it out to market quickly. We will still locally design our bread and butter cars that we have platforms for. Moving forward into design phase 2.0, we will keep our stable of cars (i.e Saga, Persona etc) and try out maybe 1 or 2 different segments with the support of Geely. Next Post: SPYSHOT: Suzuki Vitara diuji oleh Proton – SUV baru?